Mangoho have utilised our years of IT experience and Zoho knowledge to come up with a few well thought out packages designed for home businesses, aimed to get you up and running with integrated cloud business apps in a matter of days. No hardware. No software. No expensive lock in fees. Just a suite of tools that will help you build the foundations of your business. Hassle free implementation of Zoho cloud business solutions will allow you to get your home business up and running quickly and efficiently, giving your business a professional front and a powerful set of business tools at your fingertips. With Zoho Sites you can easily develop professional looking business web sites that are optimised automatically for normal laptop/PC viewing but also mobile devices as standard. Home business owners will be delighted with Zoho Sites' easy to use drag and drop features that allows you to generate websites without having to know any HTML code. Add to the drag and drop feature a complete range of themes that you can customize, built in widgets such as Google Maps, Google AdSense, Google +, PayPal, Facebook, Twitter that can be included in your web pages, a form creator for contacts, surveys, feedback etc., and home business owners have all the tools that are required to build a highly focused website for their business. 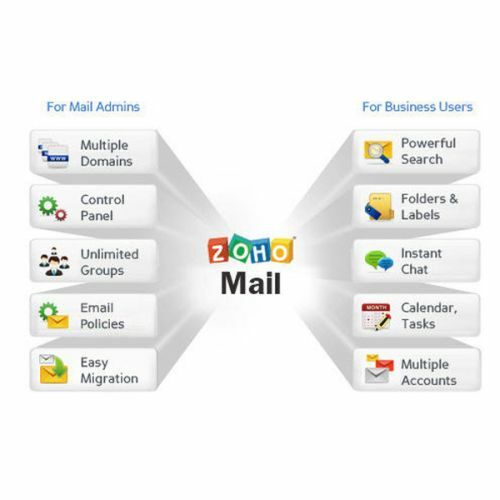 Zoho Mail is a robust and feature rich email application that is easy to set up and use, and, at the same time, has sophisticated and innovative functionality and is ideal for home business as it is highly cost effective and Zoho provides a very reliable email service. Send and receive messages in real time with the chat feature. Superb “conversation” view for easier tracking of inbox and sent emails. Multiple level folders with email message filtering. Flag and tag messages so that you can find them more quickly. Sophisticated search functionality that also includes the ability to search within attachments. Zoho Mail also includes shared calendars for better management of meetings and events. A really cool task manager feature is also included with Zoho Mail that allows you to set reminder mail, repeat tasks and assign tasks to other people. Zoho CRM's contact and sales force automation allows you manage and track leads, prospects, and business opportunities and will help you to close more deals, more quickly. And with improved customer relationship management information available anywhere, anytime, you will have more opportunities for consultancy sales, up-selling and cross selling. With Zoho CRM you can manage all your contact information and opportunities, internal and external communications, and activities, and identify how every contact fits into their organization. What this means is that you will be in a better position to qualify all of your opportunities, and, at the same time, forecast your sales more accurately. A complete range of add ons and cool application integrations. By implementing Zoho Invoice with other other Zoho applications you will be able to more effectively manage your entire home business, online. Manage all your invoice processes online; create invoices and quotes in multiple currencies and languages. And speed up your invoicing by setting up recurring invoices. Get paid more quickly by accepting payments online; Zoho Invoice supports Paypal, Paypal Payflow Pro, Google Checkout and Authorize.net for online payments. Zoho Invoice also manages and tracks all your expenses which means that you don't forget to invoice your clients for expenses such subsistence, travel and lodging. All project time worked, including your contractors, can also be recorded by Zoho Invoice which means that you can create and send invoices for your all your projects, including those in Euros. Zoho Invoice management reporting and dashboards improves the control of your Accounts Receivables by providing you immediate access to vital client information, manage and track outstanding balances, and quickly and very easily apply payments to outstanding invoices. Want To Know More About Our Online Zoho Business Applications For Home Businesses? Mangoho will get you up and running very quickly yet we understand each business has different needs. Zoho licensing and Mangoho's Zoho implementation packages and out training is flexible and suits all needs and budgets. For example, to host your professional home business website with Zoho Sites costs approximately only £25 per year, including hosting. The Business Email solution with Zoho Mail costs from only approximately £24 per user per year with 15Gb storage per user. The Customer Manager package with Zoho CRM costs approximately £185 per year for Zoho subscription fees for two users.The Accounts Receivable package with Zoho Invoice, costs approximately £116 per year for Zoho subscription fees for three users and a one time online training fee of £1,300, which provides you with ten hours online training and all materials. The Accounts Receivable package with Zoho Invoice, costs approximately £116 per year for Zoho subscription fees for three users and a one time online training fee of £1,300, which provides you with ten hours online training and materials. Implementation packages vary according to your needs and start from as little as £399. Zoho training is done with our experienced and professional trainers and again can be tailored to your needs, be done onsite or online and includes our standard and custom made training materials. And for clients who require online after sales support our support packages start at just £599 per year. For more information on the one stop packages mentioned above and Mangoho's training and support packages contact us here or drop us an email at info at mangoho dot com.